This is what my cookies came out like. But THIS is what I wanted my cookies to look like! This is a cookie from Termini Bakery in Philadelphia. I think it’s safe to say that the recipe I used is not what Termini’s uses. Their cookies are much whiter and it does not look like they use much of a leavener…. Whenever the new school begins, I start to think about all things fall, including Halloween. This past summer has been very hot, and so I’m welcoming fall with open arms this year. I love the thought of wearing a light sweater or curling up with a mug of hot chocolate on the couch to ward off the chill in the air. These cookies are perfect for pairing with that warm drink. When I saw these cookies in the King Arthur catalog, I immediately wanted to make them. The only drawback was the requirement for almond flour, which I do not typically keep on hand. Fortunately, I was able to quickly locate some at my local supermarket. The almond flavor is very subtle – not overpowering especially since I substituted vanilla extract in the place of the almond extract that the original recipe called for. I also omitted the baking powder entirely based on the results from the first batch that I baked. For my first batch, I followed the recipe exactly as stated in the catalog, even to the point of weighing the ingredients instead of simply measuring them and the results were quite disappointing, visually speaking, although the cookies tasted very good. 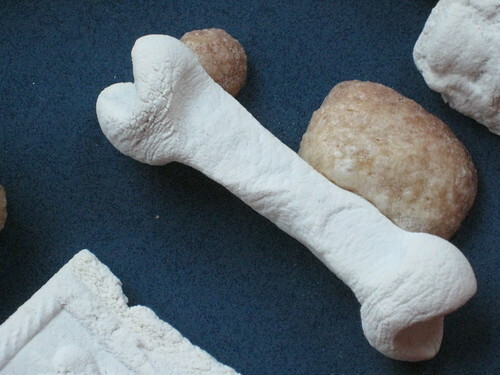 After omitting the baking powder, the cookies retained their bone-like shape and acquired a biscuit-like texture that is perfect for dipping. If you prefer a light chewy cookie, add 2 teaspoons of baking powder, leave the formed cookies in the refrigerator overnight, and let them sit at room temperature for 1 hour prior to baking. *Note that the original recipe calls for an overnight rest period prior to baking, but I omitted this step since I didn't use baking soda and I don't have much patience.